Gary Gibbs (blue) scored twice for Peterborough Sports Reserves at Thorney. 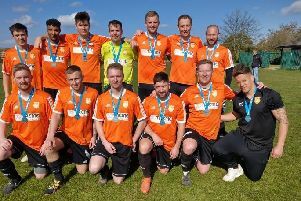 Peterborough Sports Reserves inflicted more misery on struggling Thorney with a thumping 7-0 success in the Peterborough League’s President’s Shield on Saturday (September 10). Gary Gibbs (2), Karl Gibbs, Ondre Odain, George Edwards, Chris Garwell and Andrew Boome scored the goals that moved Sports into the quarter-finals. Joe Dobson scored twice for ICA Sports against Langtoft United. Thorney have also lost all five Peterborough League Premier Division matches this season, leaking an average of more than four goals a game. Premier Division leaders Moulton Harrox also eased into the last eight with a 4-1 home success over Sawtry, while second-placed Ketton won by the same scoreline at Crowland. Joe Dobson scored twice in ICA Sports’ 3-2 win over Langtoft United and Connor Pilbeam also bagged a brace for Deeping Rangers Reserves in a 3-0 win over Uppingham. Netherton United’s tie at Stamford Lions was postponed because of a waterlogged pitch. In the only Premier Division match to take place on Saturday, Wisbech Town Reserves moved up to third with a 6-2 win at Stilton United. Thorney 0, Peterborough Sports Res 7 (G. Gibbs 2, K. Gibbs, Odain, Edwards, Garwell, Boome).